World Superbikes at Brands Hatch used to draw one of the biggest crowds in UK sport, and held at held at its spiritual home, the legendary Brands Hatch circuit, makes for an electric atmosphere and an unrivalled event. But after Brands Hatch World Superbikes in 2005, the organisers were left devastated by the headlines �Thieves strike Brands campsite�. Determined to stamp it out the following year, temporary CCTV was seen as the solution to bring the good reputation of the event back once more. Mobile CCTV Ltd consulted with the event organisers to install a temporary CCTV system with a Thermal Image Camera throughout the event. In addition, we deployed our mobile CCTV unit to patrol the camp sites 24 hours a day for the four days World Superbikes ran. 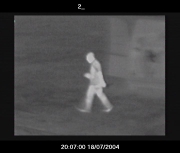 This level of surveillance remained until � from 25,000 campers � there was just one tent left. 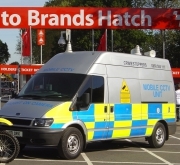 The mobile unit and the mobile security patrol worked together to appear quickly on the scene if anything suspicious was observed via the temporary CCTV or the thermal imaging camera � preventing suspect behaviour from becoming anything more. Success at this event was not as straightforward as just installing a temporary CCTV system. Winning over the hearts and minds of the biker campers was crucial. Initially accusing the surveillance operation of �trying to spoil their fun�, we managed to persuade the contingent that we were there to protect their personal belongings and their safety and security and enhance their experience, rather than allow a re-run of the previous year. And the result? At the end of the event there was one mobile phone missing (presumed lost), and headlines stating, �Fortress Brands beats thieves�. This very successful joint effort between Police, Security and Mobile CCTV Ltd ensured that the bikers had a safe and secure environment for their weekend away.